TV Personality, Political Comedian, and Late Night Show Host John Oliver shines a luminous spotlight on the condition of Immigration Courts in a recent segment on his wildly popular show Last Week Tonight (https://www.youtube.com/watch?v=9fB0GBwJ2QA&sns=em) . While a comedic lens was employed to skewer the Immigration Court System in the United States, Oliver does successfully highlight some sobering points about why the immigration system is so dysfunctional. In particular, he presents four major flaws in the current Immigration Courts that are worthy of discussing. Oliver discussed the impact of long wait times, dire delays and backlogs of cases, and the glacial pace at which new immigration judges are being hired. He also described how, beyond the emotional impact on immigrants having their lives on hold while waiting years for their cases to be heard, how by the time their cases are called, the evidence may become stale, precedential cases may become obsolete, critical facts or familial circumstances may have changed, and important witnesses may no longer be available to testify in their case. Oliver also explained how there are extreme regional disparities in how Immigration Judges rule on cases. Specifically, he noted how the rates of deportation vary from city to city. In particular, Oliver reported that while New York City has a 24% deportation rate and San Francisco has a 36% deportation rate, Charlotte has an 84% deportation rate and Atlanta has a 90% deportation rate. These disparities, Oliver noted, suggest a lack of standardization and equivalency which is unfair to immigrants living in different regions of the country. The third issue that Oliver tackled was that of representation. In other court settings a client has the right to an attorney and when an individual is unable to afford legal representation, the government will step in and appoint someone to represent him or her. 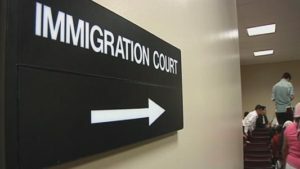 By contrast, in Immigration Court, if an immigration client cannot pay for an attorney, he or she is required to represent themselves, even if it is a child, incapable of understanding the complex nuances of immigration and an intimidating court setting. Strikingly, Oliver cited a statistic that only 37% of immigrants in the United States who appear in Immigration Court have legal representation. Oliver’s final indictment of the Immigration Court system relates to the fact that the system is not independent but rather falls under the Executive Branch of Government and the DOJ (Department of Justice), which is currently being overseen by Attorney General Jeff Sessions. He explained how this is particularly disturbing given the expressed anti-immigrant sentiments and statements made by Mr. Sessions who is not invested in fixing the system to help intending immigrants.